I had been looking forward to this film based on the previews: it appeared to be a solid western-ish action story focusing on a hardened traveler on a mission. It definitely delivered. 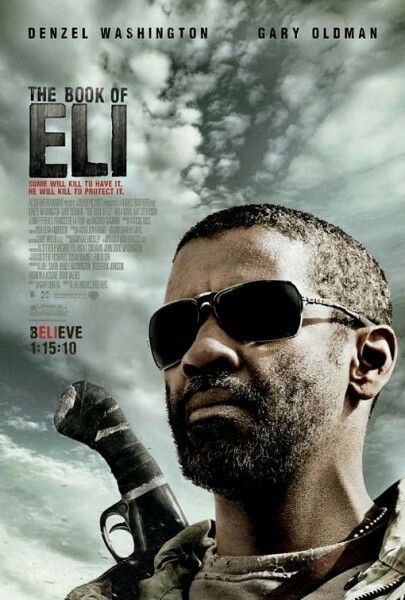 The Book Of Eli is the story of a traveler, Eli played by Denzel Washington, who is crossing the United States from East to West on foot. It’s been thirty years since the “pulse” that seems to have destroyed everything and caused the sun to become so intense that everyone must wear sunglasses and the environment is mostly desert. Technology, water and food are scarce and is seems travelers are set upon and robbed, then eaten. Cannibalism in this future gives people the shakes so when Eli encounters pockets of civilization he has to show his hands are steady. We see Eli reading a bible daily and learn he had a vision thirty years earlier that lead him to a bible and told him to go west, so he started walking and is almost there. All bibles were burnt after the war because they believed it was religion that caused the whole mess. I’m pretty sure it doesn’t take thirty years for someone to walk across the North American continent but I could be wrong. He gets into a town and barters for water since there doesn’t seem to be any currency. While there we meet Gary Oldman’s character Carnegie; he wants a bible because then he’ll have the right words to control people. Action ensues and we have some very tightly choreographed fight scenes with melee weapons. We also have firefights and explosions but it’s the fast paced machete action from Eli that gets the blood pumping. Eli picks up a companion along the way because every action hero has to have a weakness and even though he tries to not get involved this is a post apocalyptic western so the good guy falls trying to keep the damsel safe. There are a few twists at the end that I won’t reveal but it makes for some unexpected endings. The thread of the film is faith and it’s purpose and effect. Eli believes that he was tasked by God to bring this bible west and he will not be harmed, therefore he operates with that belief and appears to be invincible. Carnegie wants the bible for it’s control of people; if religion is the opiate of the masses then he wants to be the one in charge. With life so bleak the people will clamor for something better in the hereafter. There’s a scene where Eli prays before eating and Solara, the damsel in distress played by Mila Kunis, is so wowed by this she does the same at her next meal. Take from the film what you will. The main players all performed well, especially Gary Oldman and Jennifer Beals, a blind woman who is controlled by Oldman. I can’t say the story allows for any real character development: the very ending is pretty ridiculous but I’ll leave it at that. This is an action movie and on that level The Book Of Eli exceeds.